Zoodles are noodles that are made out of vegetables. These noodles are best for vegetarians and people who are conscious of their carbohydrate intake, calories, sugar, etc. To make zoodles, you will need a zoodle maker, also known as spiralizer. A spiralizer or a zoodle maker is a machine that could cut your vegetables and turn it into noodles. Depending on the model, it could also make ribbons and curls. If you have want to purchase a spiralizer, it is not recommended to buy one just because it would look beautiful on your kitchen or because it is affordable. 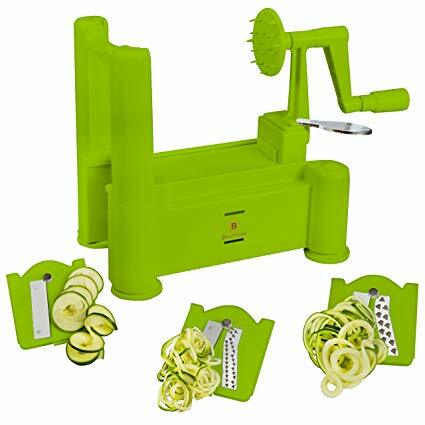 Instead, it is best to buy a zoodles maker because it is useful and has great features and aspects such as blade type and number, type of spiralizer and availability of suction feet. Paderno World Cuisine 3 is the best zoodle maker. This zoodle maker is flexible and versatile with its three interchangeable blades- straight, chipper and shredder blades. Its shredder blade is the best blade for making spiral strands that is similar to the thickness of spaghetti. If you want a salad, you could also make one through Paderno World Cuisine 3. You could make vegetable spirals using the straight blade. Both the straight and chipper blades could produce thicker strands than the shredder blade and the chipper blade is recommended for baking fries and roasting. Using this zoodle maker is easy to use and to clean as well. All you need is soap and water or you could put its blades in a dishwasher. This zoodle maker is the best heavy duty zoodle maker. Brieftons Tri-Blade Spiralizer comes in three interchangeable blades that allows its users to create different shapes and different thickness of zoodles. This zoodle maker is affordable but is sturdy and durable. It is made of stainless steel and its blades are created with Japanese 420 grade stainless steel. They are also very sharp and are 100 percent BPA free. 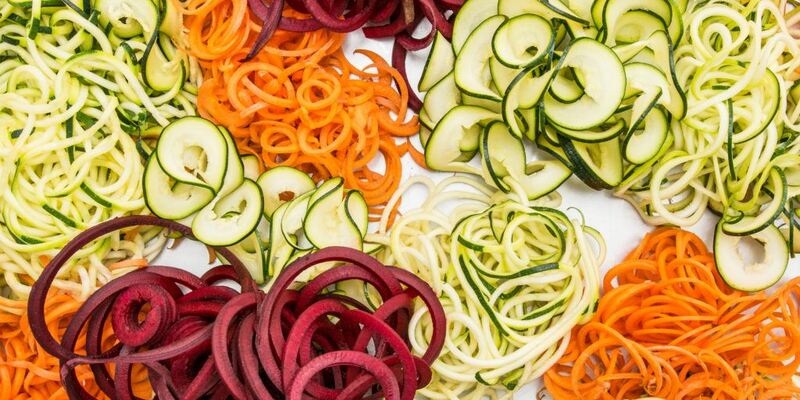 shred, peel and spiralizer any vegetable. 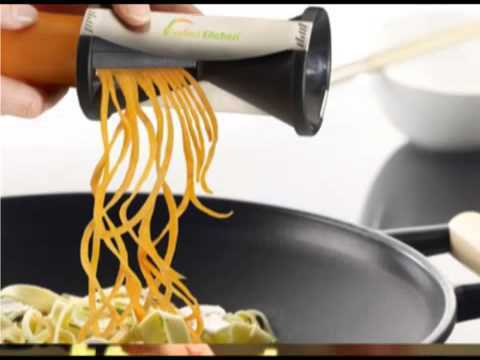 Moreover, with this zoodle maker, you could make your best Zucchini Spaghetti Pasta. Though this zoodle maker is a bit more expensive compared to other zoodle makers, you could be assured that it is very flexible and could do any zoodle making task. Aside from that, it is also easy to use and clean as well. All you have to do is to put it in a dishwasher and you are good to go. For zoodle makers, you will be ecstatic to learn that through this zoodle maker, you will be able to make fun pasta dishes, salads, spaghetti noodles and stir fries. This zoodle maker is very portable which you could bring anywhere. It is also affordable and simple to use. 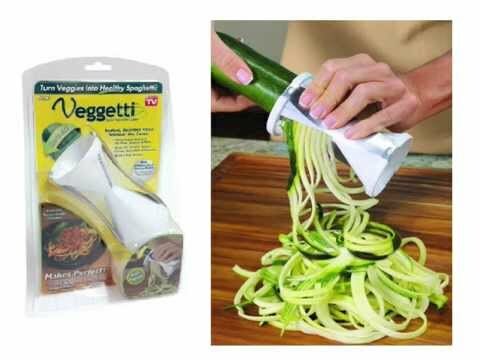 This Veggetti Ontel Spiral Vegetable Slicer allows you to use different kinds of vegetables such as cucumbers, potatoes, zucchinis, squash, carrots and many more. Through this zoodle maker, you will be able to make any pasta you wish without having to worry about carbohydrates. One of the most affordable zoodle makers, the Kitchen Active Spiralizer also comes with a lifetime warranty which makes this zoodle maker one of the most favorites. 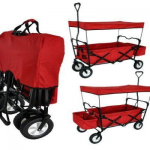 It also performs well and has wide array of features. This zoodle maker is made of ABS plastic and its blades are made of Japanese stainless steel which makes it very light yet very durable. Want to eat delicious food but at the same time eat healthy as well? Though this could be difficult, it could also be possible through the use of a zoodle maker. Through a zoodle maker, you could make pasta and other types of food without the worry of carbohydrates since you could use vegetables as alternative. Horizontal and Vertical Spiralizer – Horizontal Spiralizers are usually the ones that are operated horizontally. These model applies horizontal pressure. Vertical Spiralizers however are the ones that hold the vegetable vertically and the handle applies a downward force. 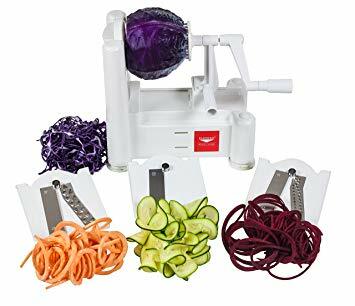 Hand- Held Vegetable Spiralizer – This type of zoodle maker is the most affordable option. It does not have handles and you will be required to operate this machine manually. Meaning, this type of zoodle maker works like a conventional pencil sharpener. Electric Spiralizers– Compared to a manual as described above, electric zoodle maker is easier and faster to use. 2. Number of Blades– how many blades you prefer to have. You will have to remember that the type of blade and number of blades are the usually identifiers of the thickness and type of vegetable cuts. 3. Suction Feet– depending on the model of your choice, you might consider this specially some zoodle makers could slip while you use. This is highly recommended for horizontal zoodle makers. How to Make Noodles from Zucchini? Who doesn’t want to eat noodles? Here is our suggestion on how to make your own noodles out of a zucchini. Chop the ends and peel your zucchini. Choose and set up your preferred size of noodles. Cook your zucchini. Soften your zoodles with oil or butter then add your preferred sauce. 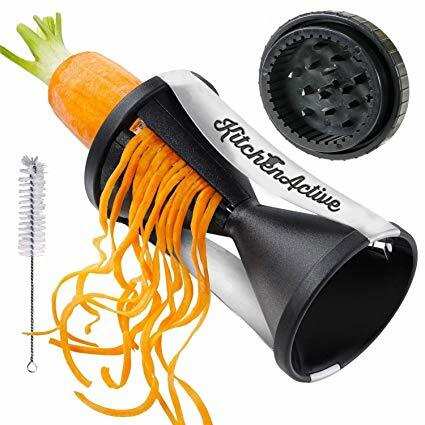 What Other Vegetables Could You Spiralize? What Dishes Could You Use Your Zoodle? Pasta – by using a zoodle maker, you could reduce your meat and crab intake. A vegetable pasta provides more vitamins and are gluten-free. How to Clean Your Zoodle Maker? One option on how to clean your zoodle maker is by taking it apart and put all the individual pieces in your dishwasher. If you do not have a dishwasher, you could soak all the pieces in water overnight. Another option is to use a brush and scrub your zoodle maker. This way you could avoid accidents of getting your finger sliced. Having a zoodle maker is convenient to have specially if you want to eat healthy dishes. 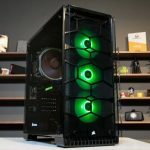 However, choosing the right unit and model could be difficult. We suggest when looking for your own spiralizer, not to consider the cost and design only but it is also advisable to check if the model is versatile, easy to clean and easy to operate. If you do not want to put in much effort, then, we suggest that you get an electric instead of manual. We hope through this article, you are able to get tips on how to choose and use a zoodle maker for healthier diet.